May is Older American’s Month, and at the Food Bank, we aim to celebrate their stories and wisdom while providing help to the 45,000 seniors living at or below the poverty line within our 34-county service area. And that’s not just limited to food. Did you know dehydration in our senior citizen community is a common cause for hospitalization? With the hot North Carolina summer approaching it is important to keep an eye on all our senior citizen neighbors, friends, and relatives to watch for signs of dehydration. Confusion, dizziness, sunken eyes, and dark urine are all symptoms of dehydration. Encouraging fluid consumption is key in helping seniors prevent dehydration. Making fluids readily available and easy to access can also help reduce the risk. 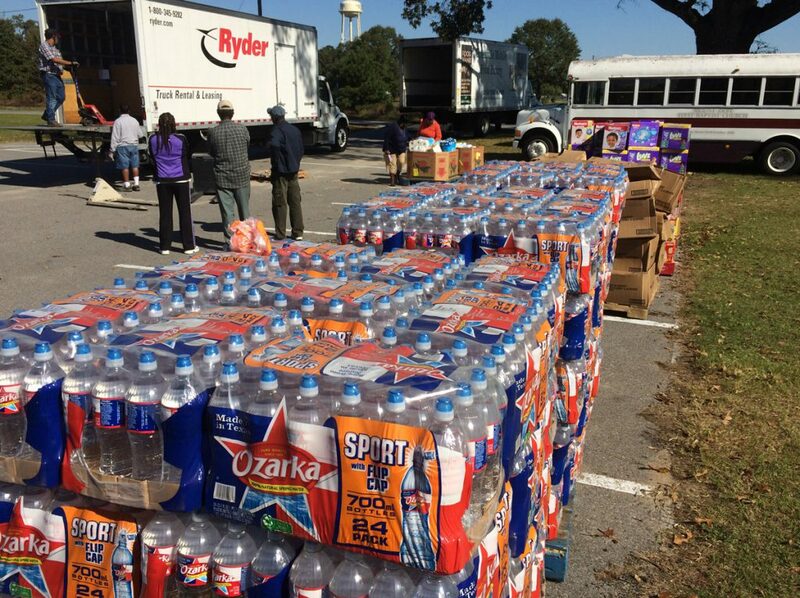 That’s why Food Bank CENC distributed 814,380 lbs. of water last fiscal year. Although our mission is “No One Goes Hungry,” we know that “No One Goes Thirsty” is just as important for ensuring overall wellness – especially for seniors. Seniors are especially susceptible for dehydration due to many factors, including: insufficient fluid intake, medication side effects, and a diminished thirst sensation. When your body does not receive the amount of fluids necessary, you can become confused, have impaired cognition, fall, and, develop urinary tract infections. When the body ages kidney function also decreases, reducing a senior’s ability to concentrate urine which can be another cause for dehydration. Adequate fluid levels help regulate body temperature, maintain blood pressure and eliminate waste. Great sources of fluids for seniors are water, soups, water-containing fruits and vegetables, fruit infused water, smoothies, and diluted juices. On the flip side, limit tea and coffee consumption due to its diuretic effects. 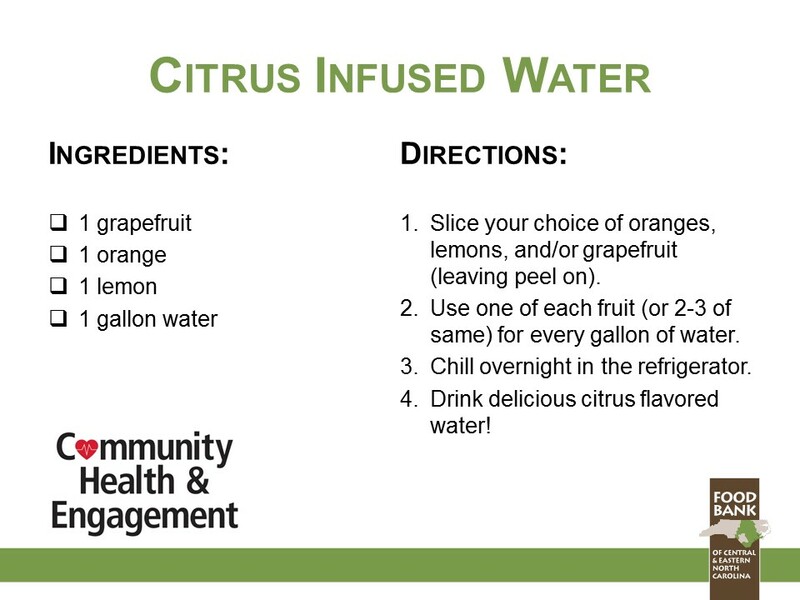 For a tasty play on classic H20, try making this easy Citrus Infused Water! Slice your choice of oranges, lemons, and/or grapefruit (leaving peel on). Use one of each fruit (or 2-3 of same) for every gallon of water. Chill overnight in the refrigerator. Drink delicious citrus flavored water! 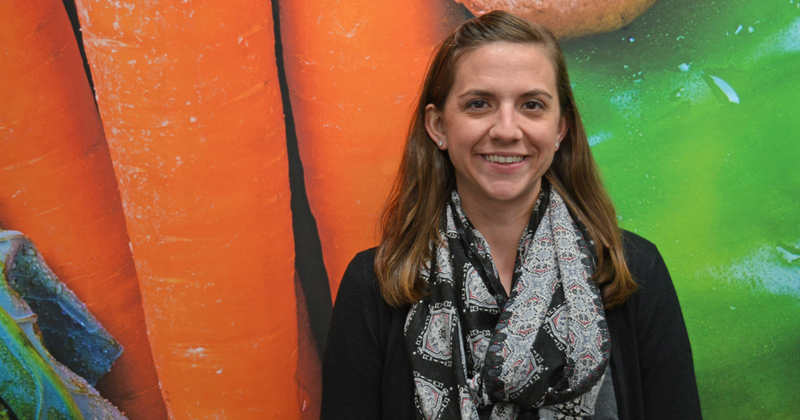 Sara Clement RDN, LD is Food Bank CENC’s Nutrition Education Manager. She helps our neighbors in need improve overall health by sharing great food choices and eating habits that work with their lifestyle. Her monthly ‘Nutrition Kitchen’ posts share stories of her work and tips for us all.